FAQ's are nothing but Frequently Asked Questions. Guruji Sri Narendra Babu Sharma give answers to various questions which are asked by the callers in the programme. Also Guruji give us the knowledge on Hindu Sanathana Dharma, which i have put in FAQ Format. Many People have lot of doubts on Hindu Sanathana Dharma, which i have put in FAQ Format. Can we leave water in the mortar (lower, stationary, stone)? No, We should not leave any water remains in the mortar after cleaning. The Grinding Stone is known as Oralu kallu in Kannada. Can we keep mortar (lower, stationary stone) and pestle (handstone) seperate in Grinding Stone? No, We should not keep mortar and pestle seperate. Can we start chanting Vishnu Sahasranamam Stotram from any verse? Yes, we can start and stop chanting Vishnu Sahasranamam Stotram from any verse. It can be chanted at any place. (If you want to chant while travelling, you can do it). Can we step on the Threshold (Hosalu - Kannada / VasaPadi - Tamil) while entering homes or temples? Threshold (Hosalu - Kannada / VasaPadi - Tamil). We are not supposed to step on Threshold (Hosalu - Kannada / VasaPadi - Tamil) while entering homes or temples. How should one receive the Theertha (holy water) in temples? It is the Hindu belief that all prayers chanted will invoke the Lord, in fire, water and air. Spiced water is offered to the Lord during the chanting of hymns. When the priests chant the mantras they imbue the water with good spirits, example the holy rivers, protecting elements (5 Life controlling elements) praana, apaana, vyaana, udaana, samaana and God himself. Water is thus turned to “THEERTHA” (holy water) during pooja. 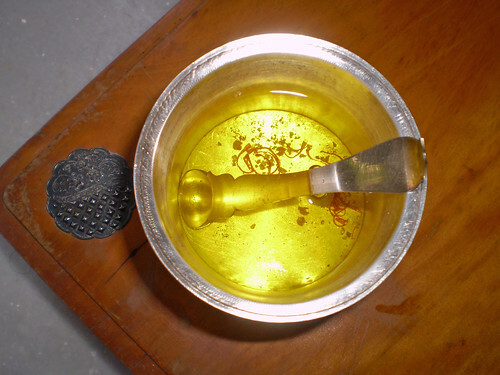 At the end of a pooja after distribution of the aarathi the priest hands out only half a spoon of this holy water to the devotee, in order that this holy water may be absorbed by the body and never desecrated, excreted or spilt on the floor. It is a practice among orthodox south Indian seniors, to visit their neighboring temples after morning rituals and receive this holy water before eating any solid food each day. Theertha should be received by placing a cup shaped form of the right hand over the left and sipped in, so that the Theertha does not run off to the floor and what is left over may be sprinkled on top of ones head. It is also a practice in South India for people to place the end of their sari or dhothi under the cup shaped right hand as a means to absorb the excess water spill, if any. Theertha should be received with reverence and devotion. Theertha usually contains water, tulsi (mint like herb), flavoring agents, lilac, cardamom, saffron, nutmeg, cooking camphor.